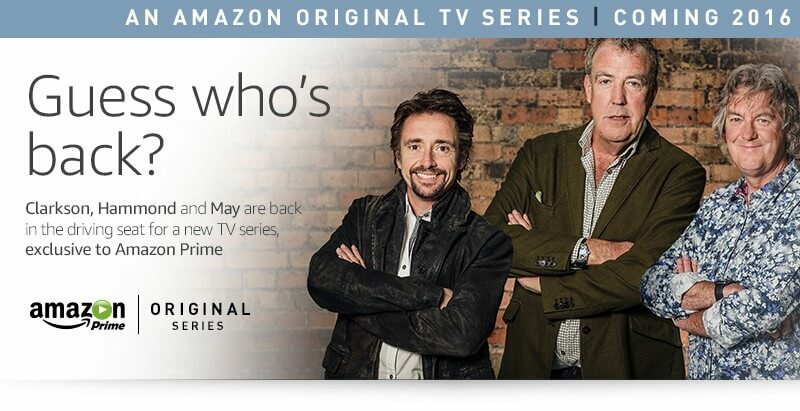 We have all been waiting to see Jeremy Clarkson, Richard Hammond and James May back in action however there has been no official release date announced yet. We do, however, have some hints on what we can look forward to. So, here’s a round up of what we know so far. The ‘Top Gear of Amazon Prime’ as we like to call it will be released exclusively to Amazon Prime customers, so if you are not already on this service you will need to sign up to be able to watch it. Amazon Prime costs £79 ($99) a year. What features can I look forward to ? As we already know the show will be hosted by the three well know ex-Top Gear presenters Jeremy Clarkson, Richard Hammond and James May so you can look forward to the same car madness and humour that we all got used to from the old show. It is, however, unclear weather features like the classic ‘Star in a reasonably priced car’ will be introduced once again. One thing we know for sure is that the Stig unfortunately will not be part of the show. It has been confirmed that there will be 12 episodes released in the first year of the new show each lasting around 60 mins each and these will be released on weekly basis. It has been said that the show will air in 4k quality which should bring us much closer to the action. No name has yet been confirmed yet but rumours suggest the following; Gear Knobs, Gear Change, Sixth Gear, New Gear and Cruise Control. Whatever the name is as long as we get to see the trio Jeremy Clarkson, Richard Hammond and James May back in action were happy. So what is the budget for the new ‘Top Gear of Amazon Prime’? Amazon has given the trio £160m for the new show which equals to £4.5m per episode, this makes it the most expensive investment by amazon for a TV series. Are there any video previews of the show? At the moment there hasn’t been any official video previews of the new show. However we have seen a couple of hints and pictures on social media. We also know that the recording of the show started late last year in September, 2015 so it shouldn’t be too far now before we can get a glimpse of the new series. So will it be as good as the Top Gear that we came to know? “To make what will be a seriously well-funded, British-based show with no commercial breaks and, better still, no editorial pressure from on high. Well that’s it – a round up of everything we know so far about the upcoming TV series which has been hugely anticipated by Top Gear fans across the world. We will be the first to update once we know more.